This fun, pint-sized boy is Boston Terrier blend Guinness! He is estimated to be 10-12 months old and arrived at the Delco SPCA’s safe haven from an overcrowded shelter where he was in danger of being euthanized. Guinness is a playful and active boy that likes to play and go for walks. He loves to play with toys too! He could live with small children, cats and other dogs. Guinness has cherry eye, which the Delco SPCA attempted to surgically correct, but it didn’t take; this is a solely a cosmetic issue, as Guiness’ vision and health are great. Adoption fees vary per animal, so please call the Adoption Center at 610-566-1370 x0 and reference this animal’s identification number in order to obtain accurate fee information. The Delco SPCA is funded solely by adoption fees and donations. Included in his adoption fee is his neutering surgery, a microchip, necessary vaccinations, a complimentary vet visit and a free bag of food! 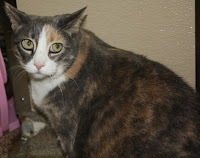 Large, beautiful Dilute Calico Lily found her way homeless when a child developed an allergy to her in Lily’s former home. Lily’s previous owner described her as a friendly, affectionate lap cat. 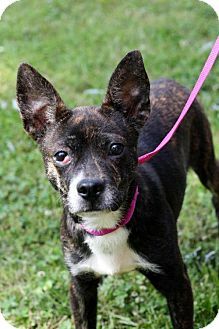 Lily is eager to find her second chance at love since being at the Delco SPCA Adoption Center for over 90 days now. She is comfortable living around children in case you would like to add her to your burgeoning family. Lily is front declawed. While Lily currently lives around other cats, she’d prefer not to as Lily likes to be the queen of the castle, so consider adding her as the only kitty to your household. You can rescue Lily or any of her feline friends 6 months or older for just a $25 adoption fee in the Delco SPCA’s “Felinefest,” going on throughout the month of June.